GameDr Video Game Timer | OhGizmo! I’m not quite convinced that video games will be the downfall of society, but at the same time, sitting on a couch all day with a controller in their hand isn’t the best way to foster a child’s mind. So the GameDr is another device designed to limit just how much time your kids can spend playing video games every day. 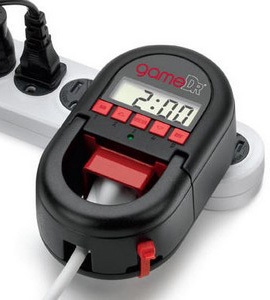 It locks onto the power cord of any video game console, or really any electronic device that plugs in by the looks of it, and features an easy to set countdown timer that will essentially ‘pull the plug’ when the time runs out. It also has a set of warnings at the 10 minute and 1 minute intervals so your kids have plenty of time to save their progress. The maker claims the GameDr is “tamper-proof” though they’ve apparently never heard of a little device I like to call a hammer. But if your kids are resorting to random acts of destruction to fulfill their gaming lust, you’ve got bigger problems than the GameDr can deal with. The GameDr will be available sometime in June from DigitalInnovations.com for $29.99. What was that suggestion you had? A hammer? Ah, yes, that will do. Considering how 2/3 consoles are PC based (xBox & PS3), just pulling the plug could result in physical damage to the console (hard-disks don't like sudden loss of power). Seems like a pretty irresponsible possibly warranty-voiding accessory. I'm thinking parents should parent their kids themselves, and not foist their responsibilities off on yet another electronic device. You knew it would come to this. Too many kids playing their video games for too long. Actually, I've seen even a better tool than this! It's called Pass2Play.com and it makes kids earn their playtime by doing academic exercises, or even potentially homework. Once completed, the kids can then play online and socialize with their friends. Once their playtime is exhausted, thay get “pulled back” out of their online game and need to completed additional exercises to earn more playtime. Now that is awesome, my mom would have loved that 30 years ago. these excellent game can boost children to really think plus a factor that while playing you can enjoy hearing music,great isn”t it?